High friction design developed for aggressive sport riding as well as racing. Sintered alloy compound provides increased durability in both wet and dry conditions. Provides a more aggressive feel than carbon pads. 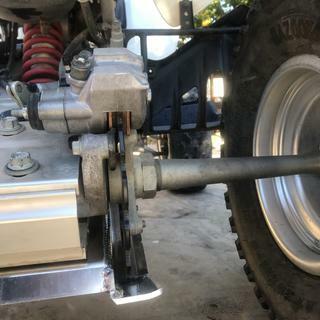 When ordering brakes for the front of an ATV, please verify how many sets you need. One set replaces the brakes on one side of the machine. I couldn’t believe the price of these. What a bargain. Perfect fit and very easy install. I’ve only used them once and they worked good. If they last at least half as long as others they are a steal. -m-2008 KTM 200 XC-- we have ran the brake pads during one muddy harescramble. It wasn't a punishing race as for the need of really good brakes. They did hold up though. I would up to giving a better review later. Cheap, fitment is great and perform like any other sintered brakes. Actually, the ONLY pads for the price. Barely 30% the cost of KTM OEM (ridiculous). Based on previous use, and this price, I bought x5 pair ... should be good to go for the next 4 maybe 5 riding seasons. Ride in lots of wet, muddy conditions and they hold up great. A bit noisy until broke in (20-30 miles of trail). x4 Stars only because would like to have the plates come with to make a complete break pad replacement set. I really like these pads. I have them on 2 bikes a '15 KTM 500 and a '16 Beat 300 RR. They work great. Don't think of them as budget pads. They are just great pads at a low price. Great brakes! They squeal until broken in but really grab the rotors! I can't tell the difference from this less expensive pad to the more expensive ones on a 65sx. Always wonder about something that is so cheap, just assume its not that good of quality. However that is not the case with these pads. Very solid, stop great after seating and reliable. I recently put these brakes on after a competitor websites brakes only lasted a one day mud ride. I ran the mountains hard and some light mud two days on these brakes. Inspection shows they are good with reasonable wear and plenty of pad left. Used these brake pads in our atvs and never had any problems. Fit perfectly and easy to change. Great bang for your buck, wish it came with the metal hardware for the rear however. The brake pads fit the machine exactly and were easy to install. They are not quite as grabby as the old pads, but for being a third the price of name brand ones I think they're pretty good. Excellent product for the price. Seems to have good durability. These are great brake pads at an unbeatable priced. I have been using them for years and they work well in all conditions. these pads are a great alternative to over priced oem pads. definately worth a try. I got these on sale here, for my 14 500exc. I've only had them on the bike for one all day ride, off road. Once the wheel was off, it took me 11 minutes before I was taking the bike back off the stand with fresh rear brakes. So far so good. I bought 2 sets, so I've got another for when the time comes, and would happily buy again. I'm by no means a pro rider, and maybe their are advantages to spending 4 times more for brakes, but I've been happy with the performance of these so far. This is a good brake pad for the price. In my opinion they wear kinda fast. If you're a racer I would go with a pad with some better quality. Great for trail riders. Good pad, great price !!! There are some better, but 3-5 times more expensive too. This is all I use now. Pads installed like any other, fit was good. I was really really impressed with how hard they grab.They bite so much better than others I have tried. I put a set of these on the front and I like them so much that the pads I just replaced in the rear with another brand are getting switched over to these. This is my first go with these so I have no idea how long they will last. The pads work fine and you can't beat the price. The longevity isn't near as good as oem, then again the price is like 1/10th that of ktm oem pads. Excellent brake pads at a great price. Provide excellent stopping power and they last a long time. Well worth the money!! metal pad on metal disk= Stopping power. Good fit, Durable, material works well in all conditions. I'm not sure why most pads cost 3-4x as much as these. I've used these pads on multiple dirt bikes with great results. I race enduro and have had zero issues. Save yourself some money and go with these. Great brake pads great price bolted right on. As always fast shipping and no need to go to town for parts. BUT I LIKE THEM. Pads are Pads. Do it. They work very well for the money, I will buy these again when needed. have installed on both my son's KX100 and KTM 250 and have had no issues. We will see how they wear in the long run. I was skeptical with the price but all seems great so far. I bought a set of these as a back up set. Once I put them on I felt that I got the same stopping power as the stock pads I had and they lasted just as long. I will buy again. Good value. They work great. You might get a bit less life like 2 weekends less then ebc or other brands but you can't beat the price. Great Value and I have never noticed any unusual wear or short life. Good quality for the price for an aftermarket brake pad. Will buy again. Once you bed the brakes in, they rock. As good as any out there. For 02 crf450. BEST ANSWER: I looked into this for you. Unfortunately we do not have aftermarket parts for this machine. But i was able to find this machine's brake shoes through the OEM tab on our page. Is quantity one a set of two pads? Two pads ( one wheel ) comes when you purchase Tusk pads .Excellent value on a wearing item. I always carry an extra set (front & rear ) in tool box for immediate replacement when necessary. Yes, 2 pads will need 2 set to do both tires. yes one set is both pads needed per axle. Yes one set! Great brakes for the price! Yes it comes with both pads. 1 set = 1 pair = 2 pads. The real question is does it come with a sticker? No sticker. It isn't like a sticker is going to make you ride better, give you more braking power, or get that trophy spot anyways. Hey you never know man! That is the real question, unfortunately there are no decals included. Does come with Rocky Mountain Stickers, but no Neutron stickers. No stickers bud, just a good, inexpensive pair of pads! No sticker. Great pads though! Does the brake pads also include the sheet metal retainer clip that holds the top of the pads? I couldn't find that part in any of the rebuild kits. Thanks! No, the clips are not included. I just re-use the stock clips off of the stock pads which fit perfectly...no issues. Only the pads were included. If you need the clips you should be able to find them in the OEM parts secrion. No, the package contained the pads only in my case. I had no issues. I ordered a new clip with the pads. Also replaced the rubber boots. Hey Darren, it does not. Hi. These pads is from rear? BEST ANSWER: Order the correct part number for the rear of your bike & you should have no problems. If you are not sure... call Rocky MT ..they are very helpful & professional . On my bike the front and rear pads are different so make sure you indicate front or rear when ordering. There are front and rear sets so just make sure that you get the correct set. these fit the rear brakes of my 2001 KLX300R. no problem. These fit the rear of my Rhino perfect. Check with Rocky Mt for proper fitment. Does it come with directions to install? BEST ANSWER: Not that I recall, but it's super easy. You don't need to take the caliper off the bike (front or rear). Just remove the anchor pin (may have a cover screw to keep mud out), and drop the old pads out. Make sure the retainer clip(s) in the caliper are in place, then insert the new pads. Hold them in place while reinstalling the anchor pin. It helps a great deal to compress the caliper against the disk to give yourself more room to install the new pads. Just push on the caliper housing and force the puck(s) into the housing. You'll need to do this regardless because the new pads will be much thicker than the old ones. If all else fails, I'm sure Rocky Mtn has a great little video on this! No but no brake pads come with instructions that o am aware of and if you need to ask that question you should probably pay someone to do it or look on you tube where rmatv has lots of how to videos. They are simple to replace. No they don’t it’s just the two pads and a sticker in the package. No, it does not. However, its a pretty straight forward process. There are no installation instructions. Will this product fit a 2015 Yfz450r ?? My raptor 700 needs front and rear brake pads. Since the rear pads are different than the front, will I be provided the correct pads or is only one type available? BEST ANSWER: As long as you select the correct brake locations that you need there should be no problem. These do not look like my rzr brake pads but is listed for my rzr, are the pictures not always accurate? Are these front or back pads? BEST ANSWER: These are front pads. Will these pads fit a '08 Cobra King/CX 50cc? Will these fit a 2005 Honda Foreman 500 4x4? These pads don't look anything like the ones I just took off. Will these fit a 2016 RZR 900? What kind of four wheelers do they fit? Do these fit an 04 ktm 250sx? 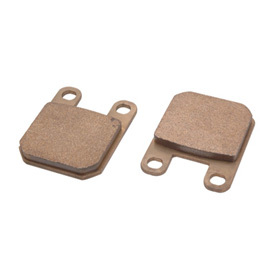 Will these brake pads fit a 2015 wildcatx 4? Will this fit a 1998 KX250 rear brake? I am aware that it says that they do, but I just want to double check. BEST ANSWER: If your machine is listed in the drop down menu then it will fit your machine. Will these fit on rear of 2016 kx250f? Will these pads fit a 1985 rm250 first year front disc brake? My KX 250,01 the brake pads don't look like these ones?